Первый из двух дальних тяжелых бомбардировщиков-трипланов Bristol Type 24 Braemar, созданных в конце Первой мировой войны для ударов по территории Германии, поднялся в воздух 13 августа 1918 года. Этот огромный самолет с фюзеляжем прямоугольного сечения имел ДальшеMore>>> деревянную расчалочную конструкцию с полотняной обшивкой, бипланное горизонтальное оперение и четырехколесные основные стойки шасси. Силовую установку первоначально планировалось разместить в фюзеляже. В конечном итоге, четыре рядных двигателя Siddeley Puma мощностью по 230 л.с. (171 кВт) установили тандемно на среднем крыле. Поскольку на самолете изначально хотели использовать моторы Rolls-Royce Eagle, развивавшие 360 л.с. (268 кВт), мощность силовой установки была недостаточной, и летные характеристики Braemar Mk I оказались низкими. Самолет использовался в экспериментальных работах и в 1920 году был пущен на слом. Второй прототип, Type 25 Braemar Mk II, оснащенный двигателями Liberty, поднялся в воздух 18 февраля 1919 года, когда надобность в тяжелых бомбардировщиках уже отпала. Эту машину использовали для испытаний, пока она не попала в аварию в конце 1920 года. Третий Braemar достроили уже в варианте Type 26 Pullman - 14-местного пассажирского самолета. Несмотря на проведенные в 1920 году испытания, самолет впоследствии разобрали. В последней попытке фирма пыталась реализовать идеи, заложенные в первоначальном проекте. Были построены два экземпляра самолета Type 37 Tramp, силовая установка которого размещалась внутри фюзеляжа и состояла из четырех двигателей Puma. Проблемы с трансмиссией, связывающей моторы с винтами, были так велики, что Tramp так и не поднялся в воздух. Самолет Tramp Boat с паротурбинной силовой установкой так и остался в проекте. As already mentioned, there will be exhibited on the Bristol stand a very fine scale-model of the Bristol "Pullman." 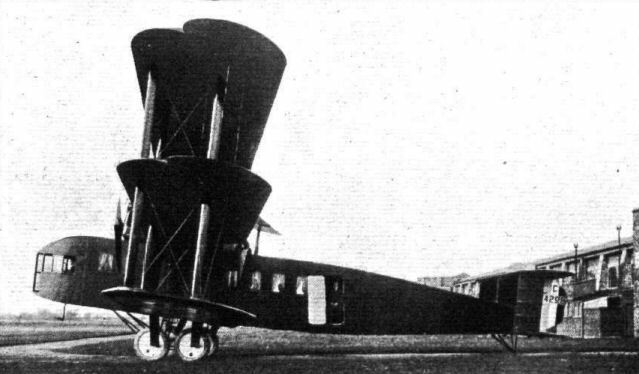 This large triplane is provided with a most luxurious cabin, seating 14 passengers, who obtain an excellent view of the country over which the machine is passing, through Triplex windows in the side. One of our photographs gives a very good idea of the comfort and spaciousness of the cabin, which has a height of 7 ft., and is heated and lighted by electricity. Fitted with four 410 h.p. Liberty engines, placed on the wings, the machine is capable of a maximum speed of 125 m.p.h., while the economical speed is 100 to 105 m.p.h. 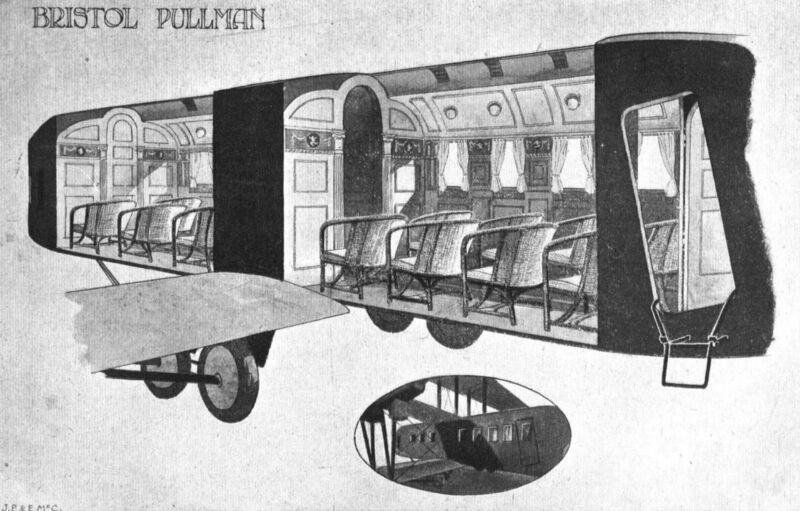 In addition to the two pilots (or pilot and engineer) the Pullman has a lifting capacity of 2,700 lbs., with a fuel capacity of five hours' flight, or 4,000 lbs. with fuel for two and a half hours' flight. These figures are based on an economical speed of 100 to 105 m.p.h., i.e. at three-quarter throttle, giving a sufficient reserve of power to reach a maximum speed of 125 m.p.h. if necessary. If desired, the seats may be removed and the machine used for carrying mails and cargo, the space available being then 570 cub. ft. The machine has an overall length of 52 ft. and a wing span of 81 ft. 8 ins. The weight empty is 11,000 lbs., and fully loaded 17,750 lbs. Climb to 5,000 ft. in 5 mins., and to 10,000 ft in 12 mins. The ceiling is about 15,000 ft. with full load. Bristol Aeroplane Co., Ltd. (STAND 59) Filton House, Bristol. Most of our readers are already acquainted with the four-engined Pullman triplane, which has recently given some very satisfactory results during a number of trials carried out at Bristol. The ordinary uncorrected air speed readings show a maximum speed of some 134 m.p.h. With the engines at little more than half throttle the speed recorded was in excess of 100 m.p.h. No actual figures were taken at this time concerning the climb, but it was said that it climbed much more like a fighting machine than a passenger plane. Especially satisfactory was the fact that the machine on every occasion took off from the ground within, at the most, 180 yards after the engines had been let out, whilst a similar run after landing was experienced. The whole of the first half of the fuselage is formed into a commodious and luxurious cabin, providing accommodation for 14 passengers in addition to the pilot and engineer, the latter occupying the extreme fore part of the cabin. The cabin is 7 ft. in height, and a central gangway affords access to the comfortable fauteuils which, though removable, are normally placed on either side of the cabin. Large Triplex glass windows are provided for the convenience of each passenger, and an adequate system of heating and lighting by means of electricity is installed. The question of ventilation has also been carefully studied. Any or all of the seats may be removed for the conveyance of mails or cargo, and a total space of 570 cubic ft. can thus be made available. In addition to the two pilots the machine is capable of lifting a load of 2,700 lbs. with fuel for five hours' flight, or alternatively 4,000 lbs. with fuel for two and a half hours' flight, These figures are based on an economical speed of from 100 to 105 m.p.h., i.e., at three-quarter throttle giving a sufficient reserve of power to reach a maximum speed of 125 m.p.h. if necessary. All three planes are given a sweep back and a dihedral angle, but are not staggered. Balanced ailerons are fitted to the top and middle wings. The tail is of the biplane type with three fins and rudders. 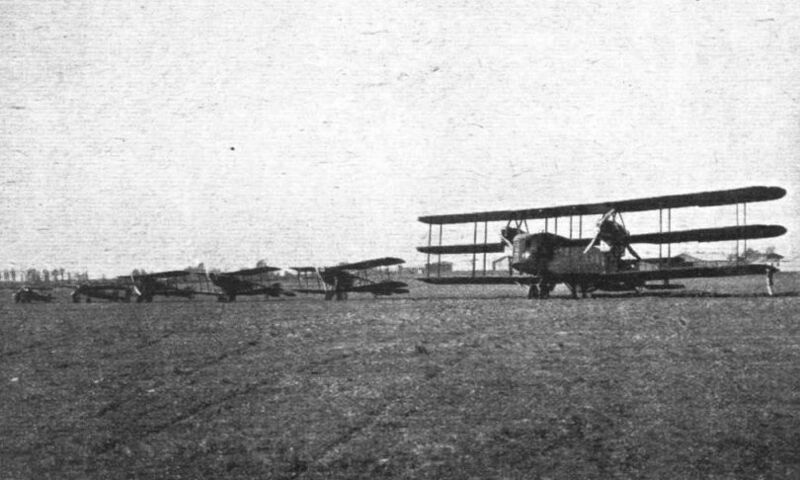 The four engines, each of 410 h.p., are mounted two in tandem on each side of the fuselage on the middle plane, and each unit drives a tractor and pusher screw. As the largest machine in the Show, a good deal of attention naturally falls to the huge Bristol Pullman triplane with its luxurious cabin, which is more reminiscent of a railway carriage than of a structure to be taken into the air. The cabin is divided into two halves by compartments for the main petrol tanks. There is, however, a narrow passage between the two cabins, so that passengers can walk from one cabin to the other during flight. A general description of the Bristol Pullman has already been given, and it will therefore suffice here to refer to one particular feature of the design which is considerably out of the ordinary. This is the four-wheeled Oleo under-carriage, necessitated by the great weight of the machine. There are two wheels in tandem on each side, supported on Vees whose limbs run respectively to the lower longerons of the fuselage and to the point corresponding to the attachment of the engine struts. The rear wheel takes most of the load when on the ground and the main function of the front wheels is to prevent the machine nosing over on landing. The movement of the wheels is rather peculiar, being a form of link motion, as the wheels, owing to the radius rods having a downward slope, have a slight fore and aft movement in addition to the vertical travel. The arrangement of the under-carriage will be better understood by a reference to one of our sketches. In connection with this four-engined giant, it is of interest to note that on more than one occasion the machine has taken off on two engines only, with full load on board. There is, therefore, little risk of the machine having to make a forced landing through engine failure, a point which is greatly in its favour for commercial work. Otherwise perhaps the time is scarcely ripe yet for a passenger carrier of this size, since she can hardly be a commercial proposition unless the full complement of passengers is carried every time. By way of showing what can and will be done, however, the machine is an excellent example of what we may look forward to some day, and needless to say the workmanship is of the quality which has made the Bristol firm famous. Этот Type 26 Pullman, принадлежавший Военно-воздушному комитету (Air Board), в 1920 году проходил испытания в Мартлешем Хит. THE BRISTOL PULLMAN: This machine has a cabin seating 14 passengers. THE BRISTOL PULLMAN: Photo shows one end of the cabin. Owing to lack of space on their stand, the Bristol firm are prevented from showing the actual machine, but a very fine scale model will be on view. MODERN CABIN MACHINES: The Bristol Pullman Triplane. 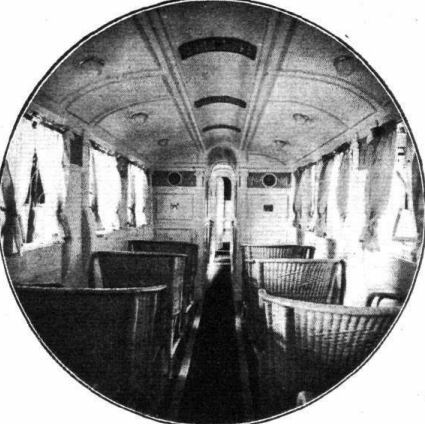 Note division of cabin into separate compartments with corridor.